Inside Storey: "Born with Sawdust Bedding in My Blood!" "Born with Sawdust Bedding in My Blood!" As webmaster, I receive all of Storey's various e-mail inquiries from our readers. Two weeks ago I received one which was quite interesting — it tells a story of a renewal of interest in raising chickens, following a long family tradition of doing so. Here is the story (told through e-mail exchanges) of Dr. Polly Coombs and her family's history of raising chickens. 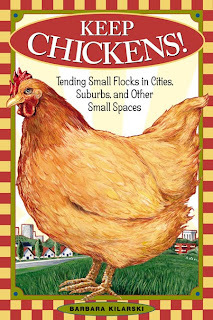 I bought Ms. Kilarski's book Keep Chickens a couple of years ago and would have, even had I not been considering doing just that in my urban backyard. As I was browsing the "chicken books" at Borders, I opened hers to chapter one and found that a photograph of my mother was used as the chapter illustration! She was the "glam" in the advertising brochure for J. O. Coombs and Son poultry farm near Sedgwick, Kansas (this was before my time quite a bit — my father and grandfather were raising white leghorns then). Dr. Coombs then inquired as to the origin of the photograph and whether she could be put in touch with the layout person who found it. As it turns out, Ilona Sherratt, our image coordinator, who has been with Storey for 20 years, worked on Keep Chickens. It didn't take Ilona long to find the image source, but unfortunately, Storey does not own the original print. I am the image coordinator here at Storey Publishing, and I worked on Keep Chickens. We purchased a bunch of old Poultry Tribune magazines on eBay. They were from the mid- to late 1930s. I am sure that the photo of your mother was scanned from one of those magazines. Unfortunately, we don't have all of the magazines here anymore. I looked through the remaining four from 1936, 1937,and 1939 but could not find the original article. What I do have, and have attached, is the scan we made from the magazine. There's a caption at least. 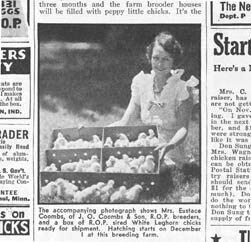 Clipping of Dr. Polly Coombs's mother from the Poultry Tribune. White Leghorn chicks ready for shipment. Hatching starts on December 1 at this breeding farm. Dr. Polly Coombs's mother was Gertrude (Trudy) Coombs, wife of Eustace Coombs. She passed away in 1960. Dr. Coombs graciously replied back to Ilona for her help in satisfying her curiosity about her mother's photograph. Thank you so much for replying to my request for information! I really enjoyed the caption under my mother's picture. 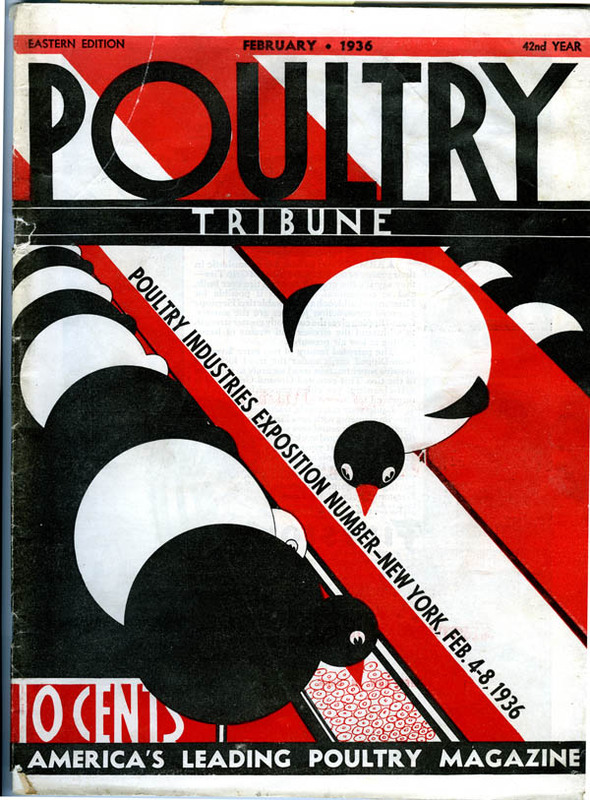 I remember the Poultry Tribune from my childhood. If the issues were mid- to late ’30s, then my mother would have been in her 30s, although she always looked younger than she was. I was born just before she turned 41. This makes me a senior citizen, and what on earth am I doing starting chicks again???!!!! My brothers, one of whom went into the hatchery business with my dad and grandfather, are a generation ahead of me. The chicks are growing like little weeds and appear to have the potential to be quite beautiful when they reach adulthood. "The Girls," as Ms. Kilarski refers to her chickens and I probably will as well, will hopefully lay eggs in abundance, commensurate with their gorgeousness! My friends are all freaking out, thinking that I must be crazy to raise chicks, but a lot of them don't know that I'm born with sawdust bedding in my blood! Again, I am grateful for your response. "Chicken people" have always been very nice, I've found! Please give my regards to Ms. Kilarski if you have any contact with her. Ilona shared her e-mail exchange with me and with Pam Art, the president and publisher of Storey. We all loved the tale of the Coombs family's past and present chicken-keeping experiences. Ilona suggested we put it up on Inside Storey; I took Ilona up on her suggestion, and I asked Dr. Coombs for permission to share her story on our blog. Thank you, Polly; you could be a "poster child" for Storey! We wish you the best of luck with your girls.